Roasted chick peas are pretty easy to make and you can eat them as a snack, throw them in a pita for a sandwich, or toss them in a wrap. They’re versatile and they can take on the flavor of the spices that you cook them in. They also add a nice crunch to salads. I love combining flavors of things I’ve tried in restaurants at home, so I played around this weekend and made shawarma flavored chick peas. The recipe combined two of my favorites – Chicken Shawarma and Roasted Chick Peas – into a side salad dish. I used millet as the grain since I had leftovers from my buckeye energy balls, but feel free to use other grains like barley, farro, couscous, and more. Bring 1 3/4 cups of water to a boil in a covered pot. Add the millet, lower heat and simmer for about 15 minutes until the liquid is absorbed. Remove from heat and fluff with a fork. While the millet is cooking, dice the onion and mince the garlic. Drain and rinse the chick peas. Pat dry. Heat a pan over medium high heat and spray with non-stick spray. Add the chick peas and cook about 5 minutes, stirring often so they don’t burn. Add the onion and garlic and cook for about 30 seconds to begin softening the onion. Reduce the heat to medium low and sprinkle in the spices. Stir well to coat the chick peas. Cook on medium low heat for 8-10 minutes until the chick peas are browned and crispy. Make sure to stir them often to evenly brown them. While the chick peas are cooking, slice the tomatoes, chop the olives, and slice the cucumber. Once the chick peas are ready, remove from heat. 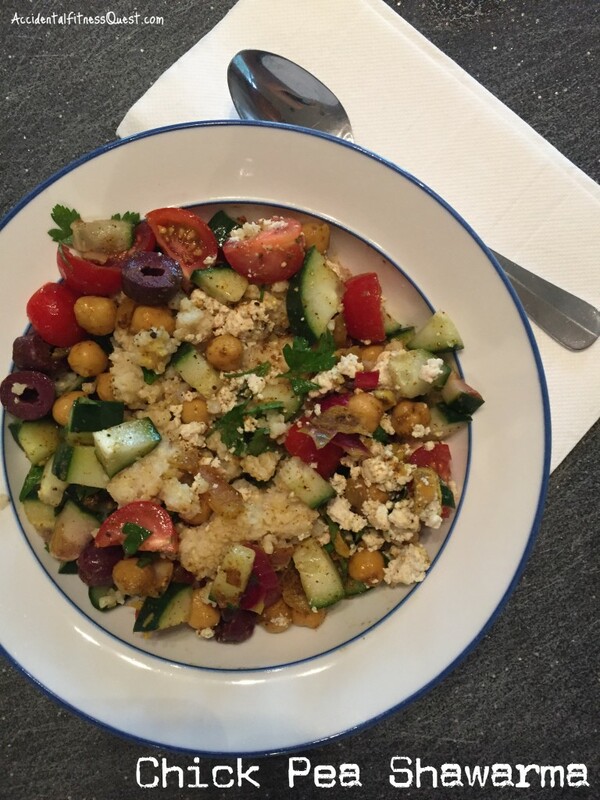 Toss the chick peas, millet and veggies together in a bowl. Divide evenly onto plates and garnish with the parsley. Makes 4 servings at approximately 184 calories each – 6g protein, 31g carbs, and 4g fat.